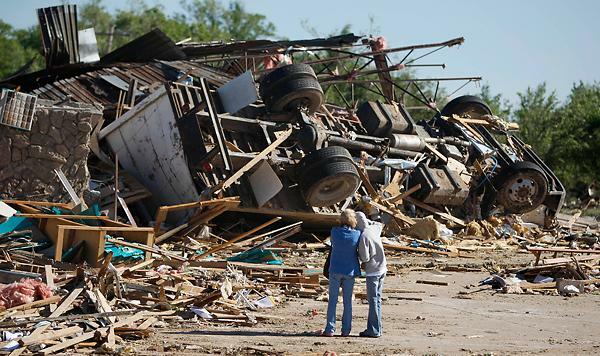 The tornadoes were unrelenting – more than 100 in 24 hours over a stretch of the Plains states. They tossed vehicles and ripped through homes. They drove families to their basements and whipped debris across small towns throughout the Midwest. In some areas, baseball-size hail rained from the sky. And yet, in a stroke that some officials have attributed to a more vigilant and persistent warning system, relatively few people were killed or injured. Wichita, Kansas, the headquarters of Koch Industries, suffered $280 million in damage from a ferocious twister, but the “ever-increasing government” demonized by the Koch brothers prevented any loss of life. This is the warmest March value on record for the Gulf of Mexico, going back over a century of record keeping. During the first two weeks of April, Gulf of Mexico waters remained about 1.5°C above average, putting April on pace to have the warmest April water temperatures on record. Only one year in the past century has had April water temperatures in the Gulf of Mexico more than 1.1°C above average; that year was 2002 (1.4°C above average.) All that record-warm water is capable of putting record amounts of water vapor into the air, since evaporation increases when water is warmer. Because moist air is less dense than dry air, this warm, moist air flowing northwards from the Gulf of Mexico into the developing storm system over the Plains will be highly unstable once it encounters cold, dry air aloft. The record-warm waters of the Gulf of Mexico are a key reason for the high risk of severe weather over the Plains this weekend. Originally posted at the Think Progress Wonk Room. In October of last year, the administration of Kansas Gov. Kathleen Sebelius (D) denied permits for two new coal-fired plants in her state because the greenhouse gases such coal plants would emit constitute a threat to the environment and public health. Last Friday, she vetoed a legislative attempt to allow the plants to be built. Opponents of the veto claimed “the decision is costing the state jobs and economic investment” and warned of “higher electric bills for Western Kansas,” where the plants were proposed. But a landmark report released yesterday by an esteemed financial research firm finds that, in fact, Sebelius has been acting in her state’s best economic interests. Innovest examined the economics of the transaction and determined that under the most plausible regulatory scenarios the decision to build new coal generating capacity will put Sunflower Electric’s ratepayers – who in this particular case are the actual owners – at significant risk. The report concludes that Sunflower’s management has not adequately addressed the competitive and financial risks associated with climate change in deciding to pursue the expansion of its Holcomb Station power plant. Sunflower was remiss in not considering that federal legislation that places a price on carbon emissions is extremely likely, considering the bipartisan support and strong international pressure for such action. In general, this analysis demonstrate that gas is the more financially sound choice for the construction of baseload generating capacity in all scenarios except 100% free allocation [to power companies] of carbon allowances. It is thus unsurprising that the coal lobby attacked the natural gas industry when the decision was made. The report also notes that western Kansas has “among the nation’s most abundant wind resources” and that the cost of wind power has plummeted 80% in the last 20 years. Last October, the Kansas Department of Health denied air quality permits to a proposed coal plant expansion near Holcomb, KS, because of the danger greenhouse gas emissions pose to the climate. This decision not only preserves Kansans’ health and upholds our moral obligation to be good stewards of this beautiful land, but will also enhance our prospects for strong and sustainable economic growth throughout our state. Instead of building two new coal plants, which would produce 11 million new tons of carbon dioxide each year, I support pursuing other, more promising energy and economic development alternatives. Industry opposition to the Sebelius administration has been intense. Following the air permit denial, Peabody Energy, one of the largest coal companies in the world, funded newspaper ads attacking the natural gas industry. Sunflower Electric Power Corporation, the rate-payer-owned company making the bid for the new plants – offered a quid pro quo to Kansas State University, promising millions of dollars to fund energy research if the coal plants were approved. without new, next-generation coal-fueled plants, Kansans will be captive to high-priced natural gas, allowing hostile foreign countries to control the energy policy of Kansas and America. We are already held hostage to some of these same countries for oil. The text of the ad runs below full-color photographs of Vladimir Putin, Hugo Chavez, and Mahmoud Ahmadinejad. The Natural Gas Supply Association and Kansas Gas Service have not yet responded. Following the precedent of Massachusetts vs. EPA, Roderick L. Bremby, Secretary of the Kansas Department of Health and Environment, announced today that he is denying air quality permits to the Sunflower Electric Power Corporation for the construction of two 700-megawatt coal-fired electric generation plants. I believe it would be irresponsible to ignore emerging information about the contribution of carbon dioxide and other greenhouse gases to climate change and the potential harm to our environment and health if we do nothing. The Sunflower project was projected to release an estimated 11 million tons of carbon dioxide annually. Update Read reports from Kansas City Star, Environmental News Service, Washington Post; commentary from the Wichita Eagle, Open Left, A Change in the Wind, Climate Change Action, Gristmill. Aug. 11, 2005: Sunflower Electric Power Corporation announces plans to build two new, 600-megawatt coal-fired power plants next to its existing 360-megawatt plant outside Holcomb. Its partner is Tri-State Generation and Transmission Association Inc. of Westminster, Colo. The project has been five years in development. Feb. 6, 2006: Sunflower submits a preliminary application to the Kansas Department of Health and Environment for an air-quality permit for three 700-megawatt coal-fired power plants outside Holcomb. The project also includes a bioenergy center to capture carbon dioxide and use it to grow algae that can be converted into biofuels. June 1, 2006: After discussions with KDHE staff, Sunflower finalizes its permit application. Sept. 26, 2006: The Sierra Club’s Kansas chapter asks Gov. Kathleen Sebelius to impose a moratorium on the construction of new coal-fired plants and appoint a commission to study their potential environmental effects. Oct. 24, 2006: KDHE has a hearing on a proposed permit for Sunflower in Garden City, drawing almost 100 people. Oct. 26, 2006: The Sierra Club’s attorney in Kansas predicts KDHE will grant the air-quality permit because Sunflower’s project is seen as important economic development. KDHE has a hearing in Topeka, drawing about 120 people, including many critics of the project. Nov. 16, 2006: KDHE holds the last of three hearings on the project in Lawrence, where opponents have been vocal. It draws about 270 people. Dec. 15, 2006: The attorneys general of California, Connecticut, Delaware, Maine, New York, Rhode Island, Vermont and Wisconsin protest the project. In a letter to KDHE, they say allowing the plants will undermine their states’ efforts to control greenhouse gas emissions. The U.S. Fish and Wildlife Service also protests, saying the project could affect visibility around Wichita Mountain National Wildlife Refuge in southwest Oklahoma, fears later allayed. Feb. 2, 2007: The Kansas House’s Energy and Utilities Committee tables a bill that would impose a two-year moratorium on the construction of new coal-fired plants. The move prevents the bill from being considered further. April 2, 2007: The Sierra Club sues KDHE in Shawnee County District Court, trying to force it to hold another hearing on Sunflower’s project. April 5, 2007: Tri-State, Sunflower’s partner in the project, announces that it is putting plans for the third, 700-megawatt coal plant at Holcomb on hold. Tri-State says its projections show it won’t need as much new power as quickly as previously thought. May 17, 2007: Raymond and Sarah Dean, environmentalists from Lawrence, file a lawsuit against KDHE in Shawnee County District Court, hoping to force it to regulate carbon dioxide emissions. June 18, 2007: Sunflower notifies KDHE that it is dropping its request to build the third new coal plant outside Holcomb. Aug. 30, 2007: Sebelius tells The Wichita Eagle’s editorial board that she personally opposes Sunflower’s project but will leave the decision on the permit to KDHE Secretary Rod Bremby. Sept. 24, 2007: Attorney General Paul Morrison advises Bremby that state law gives him the authority to declare CO2 a hazard to the environment and public health and deny Sunflower’s permit based on its potential carbon dioxide emissions. Morrison issues his legal opinion at Bremby’s request. Oct. 3, 2007: Republican legislative leaders, frustrated by what they see as delays in Bremby issuing Sunflower’s permit, form a special committee to examine the permitting process. Oct. 9, 2007: The legislative committee has its first hearing and members question Bremby. He acknowledges that his staff recommended approving Sunflower’s permit, but the department later says that advice reflected technical issues. Oct. 18, 2007: Bremby announces that he has rejected Sunflower’s permit, citing concerns about CO2 emissions.